Several readers and podcast listeners have recently emailed in questions concerning preferred stocks. It seems that these inquiries were prompted because of the levels of low-yielding cash positions they are amassing within their portfolios. So, here are a few pointers. Preferred stocks have long been thought of as a safe haven from many of the nasty downturns that occur from time to time within the equity markets. Now seems to be one of those times. During the first few trading days of 2008 the unusually high volatility is adding to an already tense situation on Wall Street. The dreaded “R” word has been appearing in conversations as we see additional data points that are moving us steadily towards a slowing economy. The alternatives for investors are contracting, particularly when we see many positions hit hard without much logic or notice. 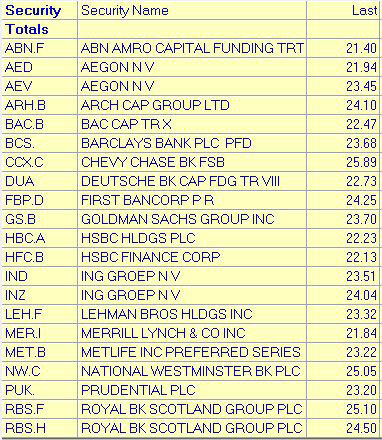 A glance at the recent 52-week high/low list for January shows a disproportionate number of names making lows. Unless we see a significant change in the current mindset of investors OR some magic from the housing and credit markets, we should plan on seeing more of the same market conditions for the next few months. So, what is an investor to do? Cash is definitely king right now and even though it seems a sacrilege to keep money out of what is usually considered productive investments, the daily whipsaw has the potential to make even the most seasoned investor take notice. Even with the ongoing credit concerns and financial stocks in sorry shape, there may be an opportunity in high-grade preferred stocks. The precise details as to the structure of preferred stock is specific to each corporation. However, the best way to think of preferred stock is as a financial instrument that has characteristics of both debt (fixed dividends) and equity (potential appreciation). Also known as “preferred shares”. The one catch is that many of these stocks seem to come from the financial sector which has not been seeing any hope of moving past their current dilemma in any time soon. 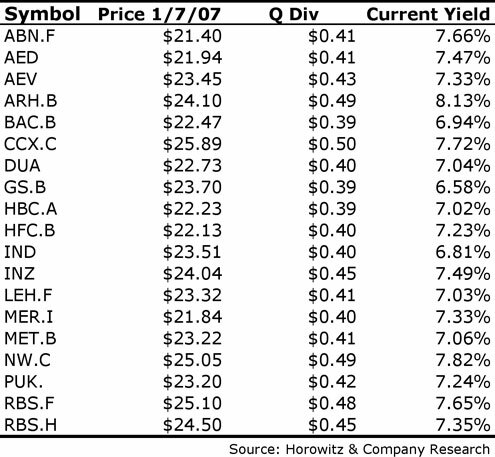 Even so, the names on the following list have good ratings and are showing a yields substantially above market. Now may be a time to continue buying some of these as an alternative to the money that will otherwise be temporarily sidelined. Realize that the current yield will help top protect some downside movement thereby giving a slight cushion if there is a downward movement in share price. Also note that on average, preferred stocks have also seen greater than usual swings recently. Usually, we have seen a maximum of a 5% variation in share price, even in poor market conditions. Recently though, some of these have seen their price range increase to 10%. Still, there is probably a place for these in longer-term portfolios that need diversification that includes fixed income. Note: The criteria used in this filter: Current yield above 6.50%, an A+ or better rating and qualification for the 15% dividend tax rate. Disclosure: Horowitz & Company clients may hold positions in some or all of the stocks mentioned.